The album kicks off with a slow, intense version of Tyner’s “Blues on the Corner,” which originally appeared on the pianist’s The Real McCoy. This version sounds little like that one, because Nowell has none of the restrained introspection of Joe Henderson, the saxophonist on that album. Indeed, while here and on every other track, the feel of a mid-’60s Blue Note session is definitely present and strong, it’s Hank Mobley who’s most likely to come to mind when listening to Nowell—and guitarist Olsson is very much pulling his tricks from Grant Green‘s old bag. Neither of those are bad things, by the way. I’ve long believed Mobley doesn’t get nearly the attention he deserves, and I could listen to Green all day long. When the band dips into its own bag of compositions, things get a little more modern, but not much. The nine-minute “Amad,” the longest track on the album by almost 90 seconds, lets Nowell stretch out into some trancelike zones, but never gets weirder than, say, David S. Ware got on Surrendered, his most mainstream-friendly album by far. His playing on Strayhorn’s “Chelsea Bridge” is thick and buzzy, recalling Coleman Hawkins, and the band’s backing is sparse, yet powerful, holding strength in reserve to allow the leader to blow lengthy variations on the blues. Pianist Lindberg is an able accompanist, but his playing seems to be more about re-creation than creation. Many European jazz players have twisted the idiom to suit their own temperament; ECM’s roster is full of such artists. Lindberg doesn’t seem to want to inject too much of himself into the music—he plays as though he’s got a mix tape of Blue Note sidemen going in headphones. Ekman and Abba are well attuned to him, and each other, but neither man makes much of an effort to draw attention to himself. Even when swinging hard, as on the opening two cuts and “Sweet Night,” the next-to-last number, they don’t do anything to create individual identities on their instruments. They’re timekeepers, and very good ones, but little more. Also, it’s worth noting that the record has a slight problem with its sequencing—four mid- to uptempo blues grooves in a row to start, a ballad, then the set’s one true burner. That’s all good, but then we get another ballad (“Walking the Path”) to close things out. And it’s a nice ballad, with some very thoughtful, almost Wayne Shorter-esque (the Wayne Shorter of 1964) playing from Nowell, but it ends the album on a somewhat down note, rather than taking the listener out with a bang. Ultimately, Stockholm Swingin’ is a good, solid live document of a band that knows how to work together and has good taste in material. It doesn’t bring much to the table that’s new, but if that’s not a problem for you (and it certainly isn’t always a problem for me), you’ll probably like it a lot. 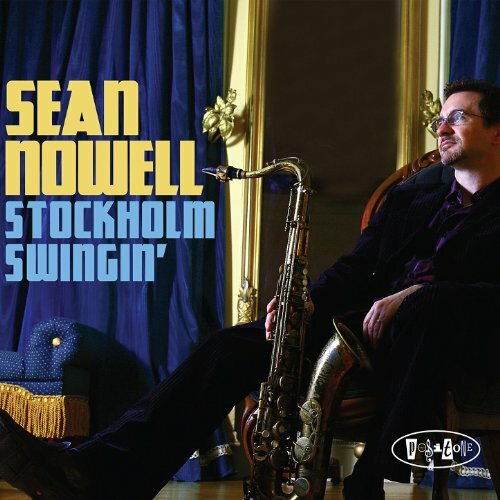 It definitely makes me want to hear more by Sean Nowell, if for no other reason than to find out whether he stretches his imagination more in the studio. UPDATE: Sean Nowell responded to this review via email, and gave me permission to reprint his comments. Thanks for the insightfulness. In the last line you mentioned that you were interested if I stretched my imagination more in the studio. I’d love for you to check out my 2nd Posi-Tone release, The Seeker. You can stream it from my website. There’s some really nice original writing and arranging there. Also my 1st installment FireWerks (streaming link) is mainly originals and is still cool after all these years.